At the end of 2015, I went back to school. A year later, I got a new job. Un enfant sage. That's what I felt like in December 2015 when I decided to go back to school. It was more a training centre than a school, actually, a hub of small start-ups called SAJE accompagnateurs entrepreneurs, in downtown Montreal. Funded by the Quebec government, SAJE helps budding entrepreneurs set up a small business. The idea I had successfully pitched them on was called Projection 21. I intended P21 as a one-man communications company, offering articles, communiqués, press kits, educational kits, and Web copy for Quebec's independent film industry and other clients, as well as translations and PR advice. 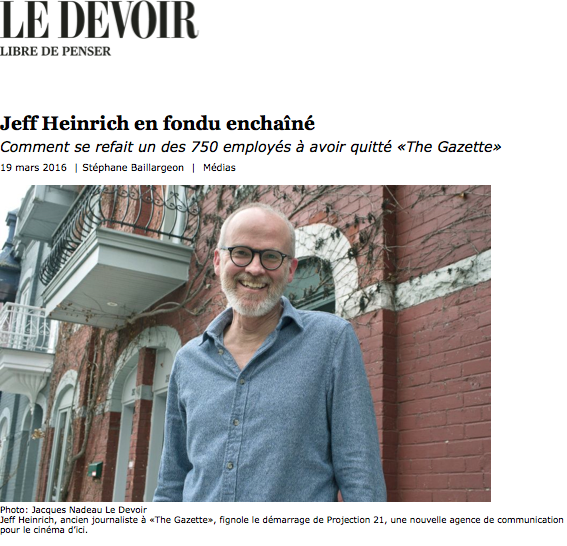 (The Montreal daily Le Devoir heard about it and ran a profile of me and my new venture.) "Projection" had a double meaning: movies are projected onto a screen and companies need to project their image. "21" alluded to both the 21st century and to my bilingualism (I write in English and French, hence 2 languages in 1 service); it was also the number of my favourite baseball player growing up, and has been a kind of lucky charm throughout my life. With the other students in my class at SAJE, I spent several months learning about starting a company: how to write a business plan, do a market study, develop clientele, negotiate prices, advertise, sell, service, bill, market, re-negotiate. Then, guess what? In October 2016, faster than you can say démarrage, I got offered a full-time job. Prospecting for translation work, I was told of a position that had opened up in media relations at Université de Montréal. They needed a new international press attaché, and three weeks after the first approach I was hired. I called my SAJE counsellor to tell her Projection 21 would have to be put on hold and that I was sorry if my training was now going to waste. "Not at all!" she replied. "Just think of your job as a very big contract!" (If there's one thing they drummed into me at (mini) business school, it's that a little positivity goes a long way.) The school, too, she told me, would soon be taking on a new identity, reborn as the École des entrepreneurs du Québec. For me, landing a staff gig at a major university means I now have a second career, a version 2.0 of my life in journalism. It even comes with an office, my first ever. I got to decorate it myself, too: there's a Zoltan Bata painting on the wall behind me and, in front of me, a poster of Fritz Lang's Metropolis. Which brings me back to Projection 21: I'm keeping the name. I won't get to "monetize" my movie-writing like I could have with a real company, won't be parlaying my love of cinema into contracts from film companies in need of a bit of PR, as I originally intended. But in my hours away from my day job, I will continue to post reviews here, on this website, and pass on my recommendations of what I see and like: a selection of feature films and documentaries that I've seen on the big screen, at festivals, on DVD and Blu-ray, via digital download and streaming. In a way, not having to think of making any money out of this is kind of liberating. It means that Projection 21 can have a more innocent function as a simple reflection of who I am and what I do. My life is now a 2-in-1 deal of working and playing, watching and blogging, speaking French and writing in English, pitching and organizing, learning and communicating, turning experience into action. Yesterday's man is now the new guy. Lucky me. No publicity is bad publicity. Take this piece that Le Devoir did on me. 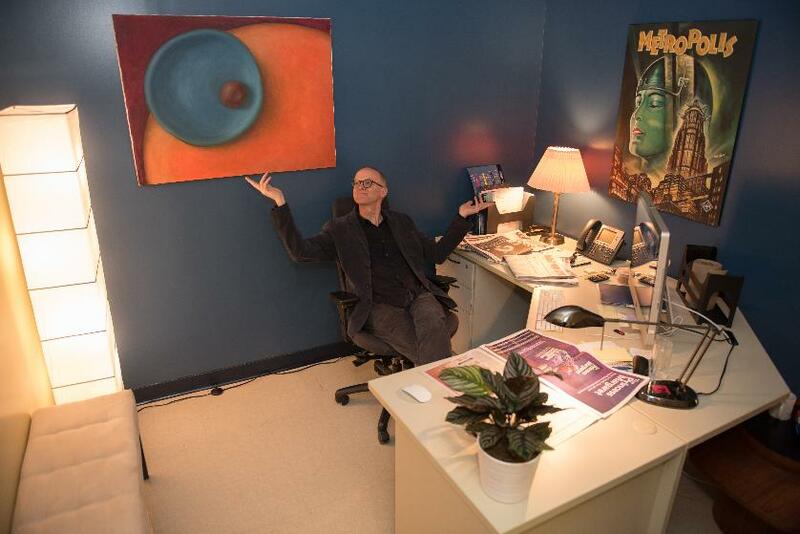 It was part of a front-page package on the dwindling market for journalists in Quebec and the creative ways some of us have found to break free and start anew. The story ran in March 2016, right after I'd completed my business plan for Projection 21, and generated some interest in my venture.